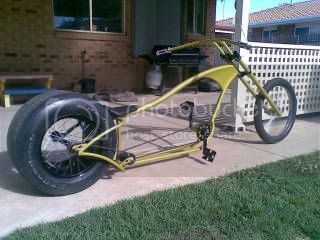 Hey there,on my way to graduating up to a motorised version,no not a motor on a pushbike either!I have made a few sleds and choppers to pass time and enjoy the odd social ride on em. This should do for now...foopy. Mate, your standards are high. Hope your motorbike looks like these babies. Awesome work. Was in your neck of the woods today..bit hot aye! Do you make the to sell? 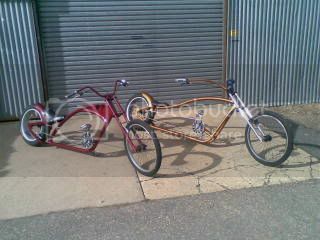 These bikes are so cool maybe PC will trade his Kawka for one. 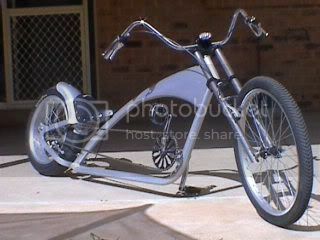 Hey thanks for the props guys.I was put onto this place by a mate who keeps telling me "you should be building motor bikes".But hey I love pushies and always will,"but thats no reason you can't build both"!Yep he's right I thought so I'm starting to get my stuff together for a Harley powered bobber but my heart is still with pushies. Cromag,yeah it's warming up a bit lately. I have 2 more Bobber style bikes to build in the coming weeks so I will post some updates and the finished products when done. 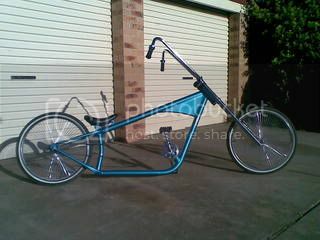 Hey Ben,I do sell some of em,but I don't make bikes to suit anyone.I make something and if people like em they find me and buy em.I don't advertise em just word of mouth sells em.I prefer to know they will go to someone who will ride em not stick it on a wall or in a pool room.Yes it has happened a few times now.But usually this way they tend to go to people who will use em not just look at em. I make em all to be ridden,no show ponies here bro.Sure there all low and they all scrape but they are ment to be,thats part of the fun I feel. Thanks for the props bro...foopy. Great to see your pushies... you obviously causght onto posting pics pretty easily. you can make future pics a bit larger if you like... up to 550 wide and max of 140thou pixels in size. I like to keep it within this size to not be too hard on guys with slow computers and internet. Andrew CA Admin wrote: Great to see your pushies... you obviously causght onto posting pics pretty easily. you can make future pics a bit larger if you like... up to 550 wide and max of 140thou pixels in size. I like to keep it within this size to not be too hard on guys with slow computers and internet. Yep I'm a post whore!Thanks for the props.I will have more in the coming weeks. How does that beast with the car tyre steer ? Do you do many K's on them ? Thanks bud,well you sort of ride the big wheel bike like a motor bike and shift your weight over the seat side to side plus boss it around with the bars.Some people are scared of it for some reason and just ride in a straight line but I can turn it around in it's own length. Yeah I ride em all the time,love em.I use to race BMX and just always had a pushie every year of my life since I was 5.We do pub crawls on em in town here with some close mates and it's cool as too have a car park full of Harleys and tuff cars and every one is checking out your pushies.They pull crowds at car shows like you wouldn't belive. Thanks again for the props...Foopy.